Before I get started--I want to quickly leave a link to a recent post on my Facebook page. If you're interested in any of the products I use and would like to get them for a very low price, or if you have any feedback for me, go check out that post! 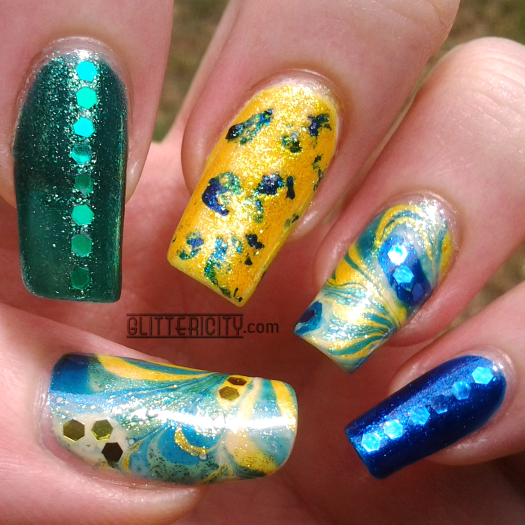 I'd love to hear your nail art requests, or other ideas for what you'd like to see on the site. If you watched the video above, you have the basic idea of what I was trying to do: marble with three colours on the ring finger and thumb, then paint each of the other nails solidly with one of the shades in the marble. 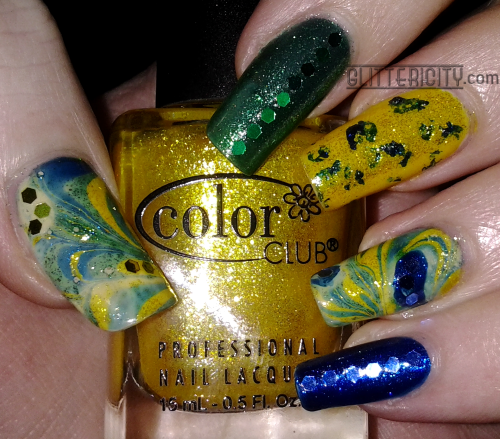 I wanted a nice shimmery design, so I chose China Glaze Blue Year's Eve (blue), Zoya Ivanka (green), and Color Club Daisy Does It (yellow), and the marbling itself went well! 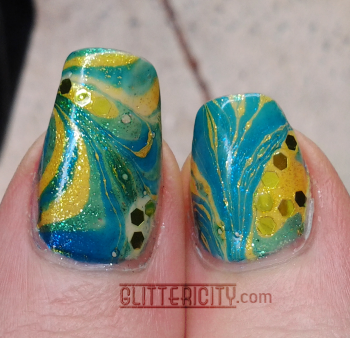 But, as I was cleaning the excess polish off the water surface, preparing to take my marbled nails out of the cup, I accidentally touched the cotton swab I was using for this to my yellow middle nail, and a swirly blue and green blob was left behind. 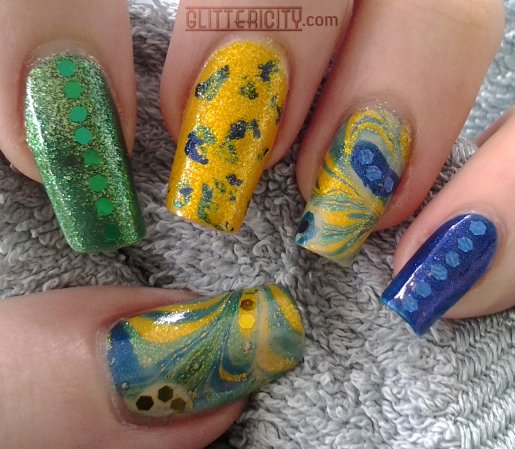 At first, I got all annoyed and thought I'd have to redo it... but then I realised that blue and green blob was pretty, so I swirled it around a little, and dabbed more splotches over the rest of the nail to make a speckly look. Cool, right? 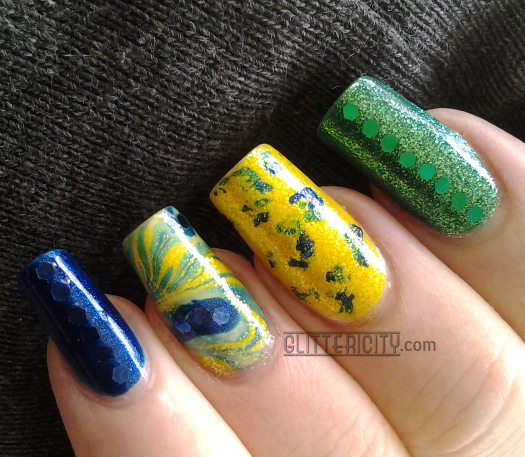 Once that was done, I had to jazz up the other plain nails, so I pulled out coordinating blue, green, and yellow Born Pretty Store glitters and applied them to the areas you see. Finally, I topcoated with Seche Vite. Outdoors in shade. And with a towel. Speaking of Born Pretty Store, now is probably a good time to share some news! I'll be doing some product reviews for you soon, and I have been given a special code so that YOU can receive 10% off any order! They sell not only oodles of nail art supplies, but hair, makeup, and other beauty products too. The prices are great, and they even ship worldwide for free! Check them out at http://www.bornprettystore.com/ and use code CITYG10 for your discount sitewide!